By 2020, the centennial of the 19th Amendment giving women the right to vote, the $10 bill will feature a portrait of a woman, the Treasury announced today. The news follows a months-long viral campaign, Women on 20s, which lobbied the president and U.S. treasurer to put a woman on the $20 bill in place of Andrew Jackson. It's a move some say is long overdue. "What is so compelling about a woman being selected as the face of the new $10 bill is that it reflects the changing tide toward equality in America, opening the door to Rosa Parks, Harriet Tubman and Caitlyn Jenner," said Geoff Cook, founding partner of Base Design, an international strategic branding firm. "This said, perhaps the best way to address another glaring inequality between men and women—income—would be depict the woman chosen at 78 percent of the size of Alexander Hamilton." Iris Yen, head of advisory and client services at Bomoda agreed. "This move by the Treasury is encouraging and a much needed step in the right direction," said Yen. "In the last 100 years, women have broken through so many barriers that most of our grandmothers could only dream of." Treasury secretary Jacob Lew is responsible for currency design. Lew is expected to select an honoree to grace the $10 bill, "a woman who was a champion for our inclusive democracy," according to the announcement, by the end of the year. Alexander Hamilton, the first Treasury secretary, is currently on the bill and will remain on it in some form. 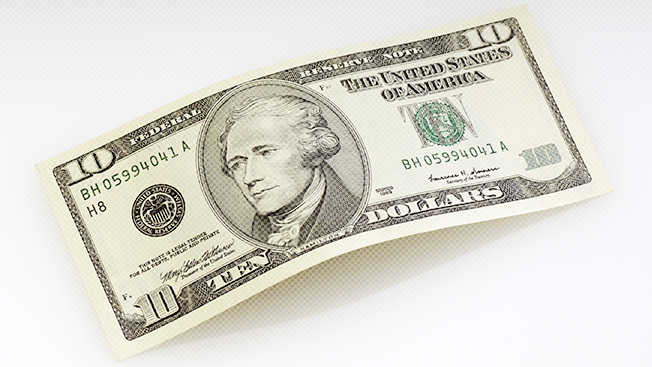 A Treasury spokeswoman previously told Adweek the $10 bill, not the $20, was next in line for a redesign. The spokeswoman said the primary purpose of redesigning currency is to stay ahead of counterfeiting, and the development of new bills is a multiyear process. To spread the word about the new $10 bill, the Treasury created the hashtag #TheNew10 and is asking the public to say "what democracy means to them" when using it. Last month the Women on $20 campaign announced that online voters picked abolitionist Harriet Tubman as the top female candidate to grace American currency. "We look forward to being part of this process that will create a currency that better reflects our society and values today and into the future," Barbara Ortiz Howard, founder of Women on 20s, said in a statement today. She also said she "hope[d] [Lew] will take into account that the winner of our online poll, Harriet Tubman, was the top vote-getter among more than 600,000 ballots cast." A representative for the Treasury did not immediately respond to requests for comment.